"You don't have to worry about me anymore, Hank; the government is doing that for you." 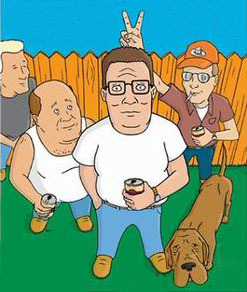 So says Hank Hill's hapless neighbor, Bill Dauterieve, to feign support for Arlen's new trans fats ban, in tonight's new episode of "King of the Hill." The episode addresses the unintended consequences of state interventions and market incentives encouraging consumer safety. After the Arlen city council bans trans fats, Hank Hill's boss, Buck Strickland buys a lunch truck and hires two cooks from the local barbecue joint Sugarfoot's to go into "the illegal food business," as Buck puts it. (At the council hearing, Hank argues sarcastically that the council may as well ban raw oysters rare hamburgers, to which a councilman says, "Great idea!" -- so they ban those things, too.) Hank is reluctant to work on the truck at first, but Buck convinces him that it is patriotic to break an unjust law, so they get to work. At one of their first sites, Buck greets a group of construction workers with the notice that the food has been priced to reflect their greater risk -- which in this case has been entirely created by government policy for no good reason. Hank agrees to work hawking banned foods, and, showing great caution, tells his lunch truck colleagues that, because they'll be a target for the authorities, "We have to be cleaner and safer than the rest." Hank's insistence on hygiene pays off when a competing illegal food truck (run by an old unsavory acquaintance of Buck Strickland's known as Rooster) bullies Hank and company out of their own "turf." And because they're operating an illegal business, Buck and Hank have no recourse to the law. Rooster wins the turf war for a time, but his victory is short-lived, as all of his customers -- a good part of the city -- come down with food poisoning. At its next meeting, a cowed city council (many of whom look as if they've been food-poisoned themselves), listens to Hank argue that it was they who drove law-abiding people to buy food they wanted from a crook like Rooster, and then overturns the ban. Meanwhile, Bill, who has bought into the idea that if the government tells him something is OK to eat, has taken to eating those things that he can in huge quantities and grown terribly obese. Hank makes him look in the mirror to make him realize his problem, which is actually helping him! Happily for Arlen, its residents can choose their own foods again, and Bill doesn't have the government worrying about his diet anymore.